1. How many points will Johnny Hockey score in his sophomore season? I believe he's made up his mind to play pro, but will take the next day or two to spend some time with family, friends, and team mates. What a run from the kid. I am getting some mixed messages. It sounds like Gaudreau legitimately hasn't decided to me. But I think when the dust settles he will realize this is the best thing for his career and sign. I hope. One of the big selling points that Calgary can throw at him right now, is that if he signs in time to play in the season closer he will effectively burn a year of his ELC. From a Calgary standpoint it feels like such a waste, but it would be a bigger waste to not sign him. Yes. Burn a year on the ELC and cash in almost a 100K signing bonus immediately. Pretty big incentive. His dad sounds like he has a good head on his shoulders. His mom of course is being a mom and wants him to experience life like a "normal" teenager. Hockey players aren't your typical teen as a real hockey player wants to be on the ice, wants to get to the next level which it sounds like Johnny wants. The only scary part to waiting the day and talking to the family I get is that they may want him to play in the area. But his dad knows the next step is signing a pro contract. It sounds like Johnny only has a few more classes anyway. Who's to say he gets those credits out of Calgary or Simon Fraser University if he were to play Heat hockey, then go graduate with his buds… Although, maybe it wouldn't work that way? Do distance courses through Boston C? I would think he signs and maybe Burke can sell that he is looking to surround him with skilled tough guys (like Wolf). From what I hear finishing school in the summer won't be a problem. The right thing for his career is to go pro now. The only option to do that is with Calgary. So I think he signs. I forgot that school existed in the summer! But there's always a loophole somewhere. Definitely worth the risk for the Flames. Would be great to see him in the last game. It's the same incentive given to just about every high end college player. Read yesterday that a NHL team is not allowed to even discuss contracts/signing until that player has decided to leave college. That would be correct. Conroy is there on standby ready to answer questions, discuss semantics with the family, and offer any insight to the Flames org. That's about it. 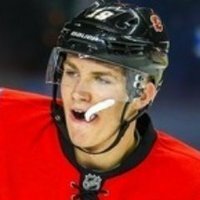 If Johnny wants to sign, then Conroy has a contract and pen ready. The same goes for Arnold. Until then, talk of ELC $ and contract parameters are off limits. Indeed. But from the sounds of it they have a camera crew, chartered plain, Conroy, etc all there on stand by. Gaudreau can be pretty certain he will get the 90K signing bonus that pretty much every prospect gets. Since, well, every prospect gets it Agostino, Kanzig, etc. Heck, Turner Elson got 35K! All that stuff is hands off until the player decides they are going pro. Once given the green light, let the swag and pampering commence. I'd prefer all prospects getting the same treatment, but it seems these NCAA kids (and their families) have to be coddled a little more to get them to commit. It has to be something they are used to as the same happens with scouts and team reps trying to coax them into their respective colleges and universities. The Flames have certainly pulled out all the stops, but it's all up to a single decision. Can't deny I'm excited for this though. He still remains my favorite prospect and I have high hopes for him. After watching the interview of him with his parents, JH has lead a life of most star athlete's of missing out on some of life's experiences. The father never thought the kid would make it but he seems to thrive on adversity. I have this feeling that we won't know until after the Hobey Baker dinner tonight. Today's going to be about getting over the sting of being eliminated from the Frozen Four yesterday, and getting prepared for accepting his award tonight, and saying goodbye to family and friends. I'm not familiar with all the rules for draft picks that go the NCAA route, but it seems like it would be so much simpler to just say, "If and when they ever play in the NHL, they play X years for the team that drafted them," regardless of how long it's been since they were drafted. I'm sure there's reasons for it, but I hate all the drama and bad situations created by the whole "wait it out and sign wherever" scenario. I liked the previous suggestions that 18-year-olds who decide to go the college route should not be able to declare themselves draft eligible. Therefore, NHL teams don't waste picks on them until they are ready to try and make the NHL. doesa any 1 know when they anounce the hoby winner? According to this website (http://www.hobeybaker.com/), it will be announced 6:00PM Calgary time tonight. Pat Steinberg confirms that Gaudreau and Arnold will be signing and available for Sunday. Boston Herald confirms Steinberg's tweet. PHILADELPHIA — “Johnny Hockey” is headed to the NHL. Boston College junior forward Johnny Gaudreau, who is all but assured to win the Hobey Baker Award as the nation’s top collegiate hockey player tonight at the Loews Hotel, has opted to skip his senior season with the Eagles. He will sign with the Calgary Flames. Gaudreau will be picked up, along with his senior teammate Bill Arnold, and flown in the Flames’ corporate jet to Vancouver, where he and Arnold will begin their NHL careers Sunday in a game against the Canucks. Gaudreau, who decided to leave BC after three years, would be the third Eagles skater and fourth Jerry York-coached player to capture the coveted Hobey Baker Award, emblematic of the college’s game best hockey player. Ex-BC players David Emma (1991) and defenseman Mike Mottau (2000) won the award. Hobey winners that played for York include Bowling Green’s George McPhee (1982) and Brian Holzinger (1995), and Mottau. BC (28-8-4) was ousted from the NCAA tournament with a 5-4 loss to Union (31-6-4) in the national semifinals last night. Gaudreau, who had a goal and two assists in the game, finished his career as the 10th-highest scorer in program history with 175 points, and is tied for ninth place in goals with 78. “Yeah, the Flames are going to have their corporate jet pick them up tonight right after (The 34th annual Hobey Baker Award ceremony) and fly them out to Vancouver and they’re going to play on Sunday,’’ said York as he prepared to head for the Hobey Baker Award announcement. Gaudreau was selected by Calgary in the fourth round (104th overall) of the 2011 NHL Entry draft. Arnold, a Needham product, finished his career with 58 goals, 86 assists for 144 points to rank 29th all-time at The Heights in scoring. Arnold, a center, also was drafted in the fourth round (109th overall), but one year earlier in 2010. Woot! Here comes my favorite prospect rolling into Calgary! Grats to Gaudreau and Arnold!